Before tackling some more substantial stuff, I have to write about changes in important details, the kind you don't especially see at first sight. This is not the only simplified thing. Quite early in PlantCatching's life, some of you wanted to hide their personal address when publishing a listing. I removed the corresponding checkbox in the sharing form because it's now obsolete. The platform evolved and you can input an address with a city or a street which does not oblige you to be precise. To finish with icons, you will also see a totally new one, as well as a corresponding tab above the map. This category is here to support the garden sharing feature. Starting soon, if you have a small or big piece of land to share with someone who will be able to cultivate it, simply because you have not the knowledge or the time to do it, you will just have to fill the usual form with this category. For both parties, it can be for the pleasure to work in the soil and create a beautiful flower bed or to share crops. Either way, this only concerns both of you, and you will have to find the right person and the right agreement to make this project a reality. One can also imagine that a new communal garden is in need of gardeners... It's up to you all to find the right uses for this feature. 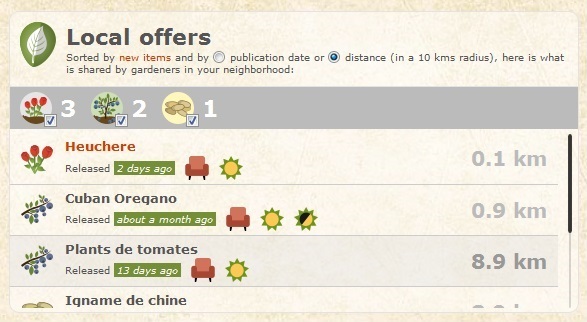 Now, for those with an account, let's have a look at the "Local offers" box near the map. To make it more useful, two things have been added. You will first be able to sort by distance or date published. At last, you will be able to filter by category. 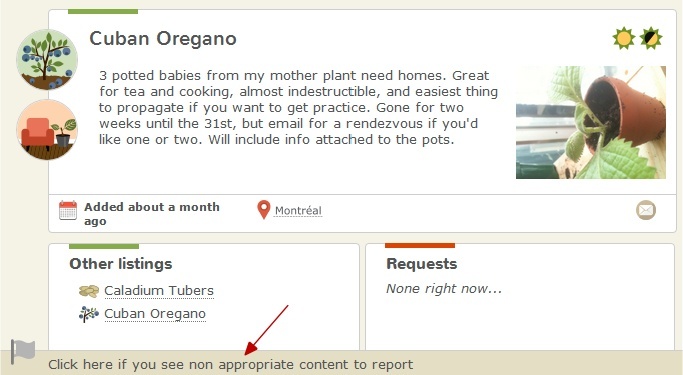 If you want to see only new ornamental plants, it's as easy as a few clicks. 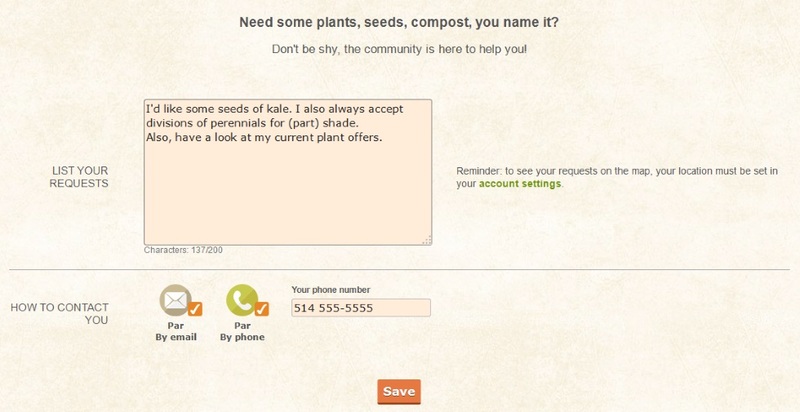 On the plants requests side, the five fields in the form have been removed and replaced by a free text field. You will be happy to know that it's also possible to set contact means. You were a lot to ask for this, so I removed this strong constraint. To finish this post, do you remember when I announced in late 2014 that I was sad to see the first spam in a listing? Instead of a shared plant, this was proposing a personal loan. That's why I added some spam handling, and it's done by you, the community. The tool appears at the bottom of the sliding panel that shows the content of a listing. If you see something that is not appropriate, thank you to use it. This will send me a contextual report and I will be able to investigate what you had seen in the panel. With your help, we can keep a good atmosphere on PlantCatching!